KOCHI: Nest Group in association with Oceanaid Group, based at Japan, has developed a technology for pollutant free water bodies in Kochi. The technology will soon been introduced in the Kochi water bodies. The presentation of the technology was held here on Saturday. Nest Group managing director N Jahangir said that with the introduction of this technology, drinking water crisis in the State could be resolved. He said that the nano bubbles developed through the technology could purify water bodies of even large size. The trial run of the project was carried out at Thevara - Perandoor canal and it was a great success. Jahangir congratulated all the members of team who made the project a reality. Oceanaid Group member and Japanese researcher Mr.Masanori Yamada, Mr.Jun Kubo, Mr.Teppei Yamada explained the functioning of the technology to purify water. He pointed out that the water bodies in Kochi are the worst polluted and stressed the need to protect them. He said that the technology now developed could purify the Thevara - Perandoor canal, which is the most polluted in Kochi. The nano bubble generators installed at the water bodies will help in cleaning it. The nano bubbles discharged from the generator will have a magnetic power to attract the waste from the canals. This will separate the waste and make the water clean. The nano bubble generators can be operated at a very low power. Thevara- Perandoor canal can be cleaned completely if 20 units of generators are kept 400 metres apart. Oceanaid Group members Mr.Masanori Yamada, Mr.Jun Kubo and , Mr.Teppei Yamada were also present during the presentation. Prof K V Thomas, MP, said that this technology could change the entire face of Kochi. The people in Kochi are facing scarcity of water, he said, and lauded the efforts of Nest Group in coming out with a project of social commitment. Mayor Soumini Jain said that this technology brings hope to the people of Kochi. Though Kochi Corporation takes initiatives to clean the canals, it never was fully successful. 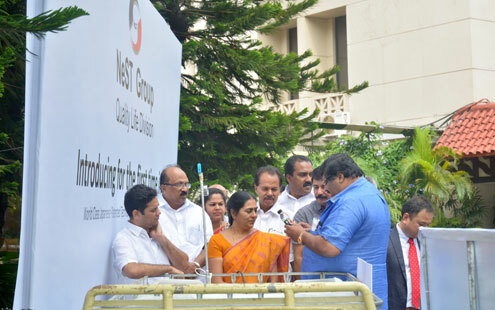 She also hoped that the technology could bring a great change in Kochi water bodies. 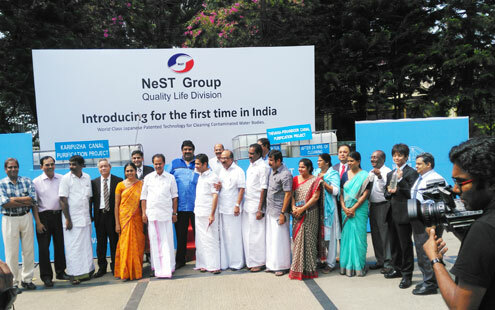 P T Thomas,MLA, said that the venture of Nest Group could make the name ‘God's Own Country’ a reality in Kochi. A M Arif, MLA, Aroor, suggested that the project should not be confined to Kochi alone but should be expanded to other parts of Kerala including Alappuzha where there are drinking water scarcity. Hibi Eden, MLA, Asha Sunil, district panchayat president, Mathew Urumbath, KMA president, pollution control executives and others participated.